MULTIPLE OFFERS - BEST AND FINAL BY THUR EVENING FEB 21. Investor/handyman/or DIY special. Great buy and hold, renovate to resell, or occupy and create equity. Wonderful home w/ lots of charm/character. Some repairs/renovations needed. Bungalow style home built in 1936 and boasts beautiful hardwood floors throughout. Kitchen and bathroom have had some updates; hot water system recently changed to tankless. 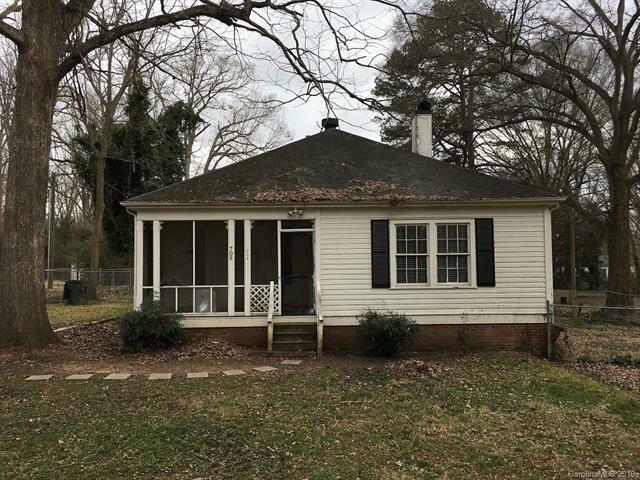 Relaxation and additional square footage available on the screened-in front porch (112 sq ft), sunroom (80 sq ft), or deck in the back (112 sq ft). Large, flat lot with fenced backyard and plenty of majestic, mature trees. Home also has large attic w/ drop down stairs and high clearance. Large 16x17 storage building in back; another separate storage shed needs demo'd or repaired due to damage from fallen tree. Gastonia's FUSE district coming soon and nearby. Preference to cash buyer and quick close. Home being sold 'as is'. Don't miss out on all this one offers at great price point! Sold by New View Realty Group.